Designed to help healthy individuals support memory, focus, and think faster! Until recently, it was believed that the typical human brain, containing about 100 billion nerve cells (neurons) could neither repair nor regenerate itself. We know better now. We know that we truly are able to protect, restore and enhance brain and neurological function. That’s what Neuro-Force from Prairie Naturals is designed to do for people of all ages. What is Neuro-Force & What Does It Do? Neuro-Force is a research-based natural health product formulated by natural health care experts to improve brain health and support daily cognitive wellness. 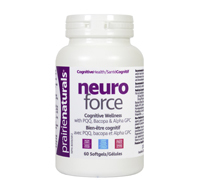 Neuro-Force provides safe, effective and timely cognitive and neurological benefits. These benefits also include improved memory and enhanced mental focus. What are the Ingredients in Neuro-Force? 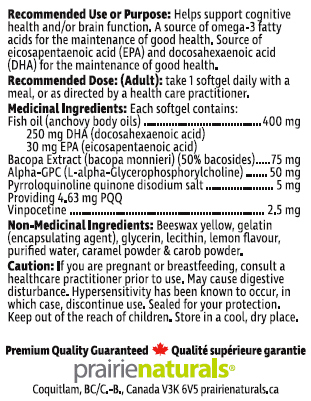 Docosahexanoic acid (DHA) - Think about it. Sixty percent of our brain is made up of fat and DHA, an omega 3 fat, makes up 15-20 percent of the brain's cerebral cortex! When DHA intake is inadequate, nerve cells become stiff and more prone to inflammation which impedes intracellular neurotransmission. Research shows that low levels of DHA are linked to memory loss and Alzheimer's disease while adequate levels restore cognitive abilities, improve rate of learning, reduce mental decline and prevent brain degeneration. Vinpocetine - Researchers report that vinpocetine increases blood flow to the brain, reduces inflammation and protects the central nervous system against degenerative conditions such as Alzheimer’s disease and Parkinson’s disease. Students and people of all ages wanting to enhance brain power have been shown to benefit from its use. Many studies have also concluded that vinpocetine has an exceptional ability to reverse the signs of brain, skin and nerve aging. Pyrroloquinoline Quinone (PQQ) - First identified in 1979, this vitamin-like compound has a wide range of benefits to brain function! As an extremely powerful antioxidant and nerve growth factor stimulant, PQQ supplemented diets show remarkable benefits including improved memory and cognitive functions with increased cerebral blood flow; reversal of cognitive impairment caused by chronic oxidative stress and improved performance on memory tests; brain and nerve cell protection; stroke reduction. Bacopa Monnieri Extract - A recent study published in the journal Aging (March 2016) shows that this herbal extract exerts “a neuroprotective effect against mental diseases, such as depression, anxiety and Alzheimer's disease.” The researchers found that Bacopa monnieri extract reduced learning deficits, improved long-term spatial memory, and reduced brain plaque load. Designated as having neuroprotective effects, the researchers suggested it be considered as a novel treatment for Alzheimer's disease. Alpha GPC-L-alpha-glycerylphosphorylcholine is a recently developed cognitive enhancer involved in the release of free choline which is then utilized for acetylcholine and phosphatidylcholine biosynthesis in the brain. This unique phospholipid helps repair brain cell membranes and counteract cognitive impairment related to dementia, brain injuries and stroke. Neuro-Force is made in Canada and licensed by Health Canada as a compliant Natural Health Product (NPN). Neuro-Force is gluten-free and does not contain soy, dairy, egg, corn, artificial colours, sweeteners or preservatives. Whether you’re cramming for an important exam or just feeling the brain strain of daily life, the nootropic benefits of Neuro-Force can help you remember better and think more clearly. Nootropics (pronounced noh-oh-troh-piks) are a category of substances that are commonly referred to as “smart drugs” for enhancing cognition and memory and facilitating learning. Nootropics work to boost brain neurochemicals - neurotransmitters, enzymes, and hormones - by improving the brain's oxygen supply and stimulating nerve growth. This unique group of memory and learning-enhancing substances also protect the brain against physical and chemical injury, including oxidation.